Kementerian Sosial Republik Indonesia - Kementerian Sosial or referred to as "KEMSOS" is the Ministry of Social Affairs of the Republic of Indonesia. KEMSOS was formerly known as the Department of Social Affairs (Indonesian : Departemen Sosial or abbreviated as DEPSOS). Th Ministry of Social Affairs of the Republic of Indonesia is one of the ministry in the Indonesian Working Cabinet (Kabinet Kerja) which oversees the social affairs. DEPSOS has its legal domicile in Jakarta and its head office is registered at Jl Salemba Raya No 28 Jakarta 10430. The Ministry of Social Affairs was lead by the Minister of Social Affairs (Mensos). 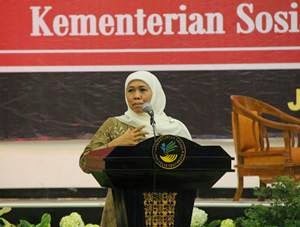 Since October 2014, Khofifah Indar Parawansa was appointed by the President Joko "Jokowi" Widodo. She was appointed as the Minister of Social Affairs to replace Salim Segaf Al-Jufri. According to The Ministry of Social Affairs Profile as quoted by JobsCDC.com, the organizational stucture of the Ministry of Social Affair consist of 1 Secretariat General, 1 Inspectorate General, 1 Agency and 3 directorates. Have attended training in social work and implementation of social welfare. Hands-on practical experience in the field of social work/social welfare services. Have attended training in social work and implementation of social welfare is preferred. Hands-on practical experience in the field of social work/social welfare services is preferred. Have attended training in the field of computer/data processing and internet. Hands-on practical experience in the field of computer/data processing and internet. Have attended training in the field of computer/data processing and internet is preferred. Hands-on practical experience in the field of computer/data processing and internet is preferred. Willing to work full time and placed in the area in accordance with the needs of PKH. Not located as a board, and a member of or affiliated political party. Never or are currently lodged a legal case, both civil and criminal. Minimum age 19 years and maximum 45 years in April 2016. Free from drugs and other addictive substances. College graduate or a school accredited study programs for Bachelor, Diploma and Vocational/SMK. Not tied to a contract with another party. Operating knowledge of computer and office automation. Willing to sign the Integrity Pact if elected as Pendamping and Operator PKH 2016. JobsCDC.com now available on android device. Download now on Google Play here. Please be aware of recruitment fraud. The entire stage of this selection process is free of charge. Kementerian Sosial - Recruitment SMK, D3, D4, S1 PKH Program Kemsos April 2016 will never ask for fees or upfront payments for any purposes during the recruitment process such as transportation and accommodation.